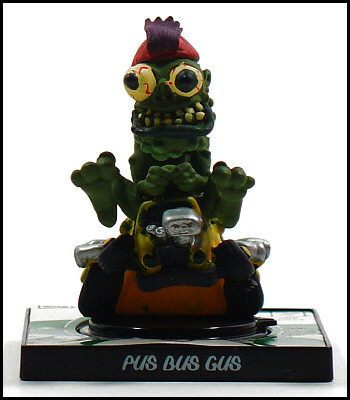 Woo, another repaint -- though, technically speaking, Zip Zit was the repaint and Pus Bus Gus is the original. Again, he's a naked guy riding atop some kind of vehicle -- which here, given its yellow color, more resembles the school bus I think it's supposed to be -- but this time the dark green helps to make him look more like a warty monster from than a naked albino sewer mutant covered in pulsating pustules. That may not sound like much of a distinction, but I find PBG much easier to stomach than Zip Zit. 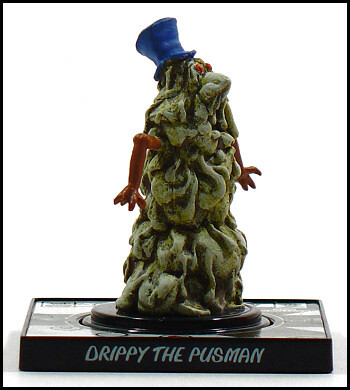 Whereas PBG even seems like he might be a cool guy, I just can't get past Zip Zit's grossness. Less than ten more days 'till Halloween!!! Pus Bus Gus REALLY looks like something from an album cover. Actually, most of these characters do. I'd like to know where you're getting your albums! Granted, I don't browse the music sections of stores much, but I rarely see album covers with visuals half as interesting as the Creepy Freaks.